Home » PCU Zeitgeist » Cosplay Life » Cosplay Spotlight: Shasta S! How long have you been cosplaying? I’ve been a hobby costumer for about 15 years and I started attending cons regularly in 2009. What characters have you cosplayed? This year, my solo cosplays included Mumei from Kabaneri of the Iron Fortress, Arslan Altan from RWBY, and two versions of Dee from Rat Queens. My family of four has also done a Saga group and a DC group. What inspired you to start cosplaying? 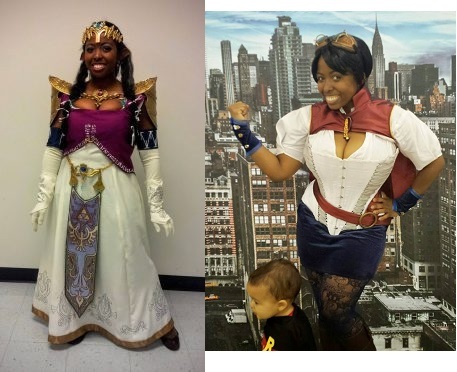 I always had a voice in the Halloween costumes that my mother made for my brother (also a cosplayer) and me, and I started teaching myself to sew when I was 8 years old. Regular clothing wasn’t my favorite thing, because I’d spent the majority of my school-aged years in a uniform and didn’t really know what fashions were “in”. When I got to college, there were a lot of themed parties where I could get away with wearing what is now called “closet cosplay” or “everyday cosplay”, and I realized that I was more comfortable in those fun clothes than jeans and a t-shirt. Years later, I went to my first renaissance faire and realized that cosplay was a real and valid subculture, so I completely threw myself into making costumes and attending cons. Now, my husband and our kids have become my inspiration with their support and shared costume enthusiasm. What do you do when you are not cosplaying? When I’m not actively cosplaying (and creating new cosplays), working my full-time job, or being the best wife & mom ever, I’m reading, dancing, or playing games, board, card and video. What costumes have provided the biggest challenge and rewards so far and why? My biggest challenge is always time, and making brand new costumes for a family of four requires a lot of time. That being said, regardless of whether I’m in a group or solo, any costume that I’m able to finish before an event provides the biggest reward. I completed my Princess Zelda from TLoZ: Twilight Princess in something like 40 hours, and the biggest challenge was coming up with shortcuts for every step of the process. I used fabric that I already had in my stash, which cut out a shopping trip, but I had to modify unrelated patterns that I’d never used before. My embroidery hoop was too small to do the dress, vest, and belt detail, so I used puffy paint and pieced together the largest section with iron-on transfers. I had no experience with craft foam armor, so I spent most of a weekend reading tutorials and watching videos to get the “metal” pieces done with minimal layers and drying time. It was completely insane, and I didn’t sleep much, but I learned a lot of new-to-me techniques and that whole costume is still [miraculously] wearable. My favorite costume has been “Batgirl, 1567”. We needed a family costume that would work for both a comic event and the ren faire, and I’d made a “Lord Clark of Kent” for my husband back in 2009 (influenced by Marvel, 1602). Our daughter loved Wonder Woman, so I decided to be Batgirl. I designed the costume to incorporate Batty elements—a red attifet (fancy head covering) for Barbara Gordon, purple side lacing for Stephanie Brown, hidden utility pockets in the bodice, and bat bracers. I had played Assassin’s Creed II, so I wanted to make the costume fancy with trims and a lot of hand sewing, but also functional with breeches rather than a three layer set of skirts. For my daughter’s Wonder Woman, I did much of the same design with pseudo-historical elements, but in materials sturdy enough for a toddler. Being able to cosplay with my family is one of my favorite aspects of the hobby. What is the best advice you would give someone new to cosplaying? Don’t focus on what other people will think or what they’ll want to see or what other cosplayers are doing. Make a costume that makes you feel amazing and that you can literally play in. Take your time to focus on the details that are important to you, so that you can have lasting pride in your work. What is one thing the cosplaying community can do better when it comes to dealing with each other? We need to be kind to one another in the hopes that people outside of the community will do the same. When one person shames or criticizes or scoffs at another cosplayer’s efforts, it makes the non-cosplayers think that it’s acceptable behavior. It’s not. That behavior is also very intimidating to new and potential cosplayers when all they see is ugliness at cons and especially online. The community as a whole needs to regain perspective, and get back to having fun. Being bullied is not fun. 1 Comment on Cosplay Spotlight: Shasta S! Reblogged this on Green Linen Shirt.